Of the four books I’m giving away, this one is the only one that actually dates from my high school reading years. Which means that I first read this book (well, these books…but we’ll get to that) at least eight years ago. Wow, I just blew my own mind. Every Friday after co-op (weekly gathering of homeschoolers for socializing, also, some teaching occurs as well), I would head across the parking lot to the public library behind the church we used. I can still close my eyes and picture Crown Duel sitting on the top shelf, a white spine mixed in with some many other darker colors—well, two white spines. Crown Duel was originally published in two volumes: Crown Duel and Court Duel. I personally, prefer the two separate titles because of the symbolism that the changing of one creates, but seeing as how I have no say in the matter… Anyways, I pulled down the books and there she was, this girl with sword propped over her shoulder and a nasty looking black eye. It looked exactly like my kind of book. I believe that I mentioned in a previous post how Lord of the Rings was the book that got me writing (First person to correctly identify that post gets a double entry into this drawing). Crown Duel is the book that got me writing my own stuff. 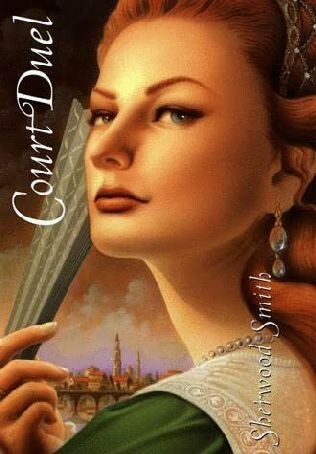 It is also the book that most heavily influenced the first drafts of the Cinderella retelling that’s sitting on my computer waiting for me to rewrite it (which will happen, just as soon as I finish with Mind Games and etc.). The only real story I had completed before then was my little LOTR-wannabe. While the idea for Shattered‘s premise was inspired by another book entirely, everything else was originally influenced by this book right here. My copy has been read a couple of times, so it’s a little battered. It even spent a few years buried in my brother’s room because he’d been interested in it (I finally told to either find it or buy me a new one). This is one of the few books that I have been able to introduce into my circle of friend (come to think of it, all four books make that list) instead of the other way around. It has everything that I love in a book: adventure and misadventure, a smart sword-wielding heroine, mistaken identity, a dysfunctional romance (in a good way, not in a Cathy-and-Heathcliff way) and a whole lot of intrigue. And you can get you hands on your own copy of this book (as long as I will be shipping to an address in the good ol’ U.S. of A). 1. Follow me on Twitter (@TheGladElf). This is good for one entry for anyone who follows me after10 a.m. today EST. Please make sure that you put your Twitter username in your comment so I know to credit you. 3. Subscribe! Sign up to receive my blog posts as they come out and you’ll get not one, but two extra entries into each drawing. The only other rule for the extra entries is that if you already own any of the books, please let me know so that I can take out your entries for that particular entry. EDIT: The deadline has been extended until 9:00 p.m. Sept 8th.